This application protocol describes a reliable and reproducible protocol for the generation of monocyte-derived dendritic cells (Mo-DCs). Using high-quality reagents that ensure cell viability, the resulting Mo-DCs can be used for downstream phenotypic and functional characterization. PBE Buffer: Prepare a solution containing phosphate-buffered saline (PBS), pH 7.2, 0.5% bovine serum albumin (BSA), and 2 mM EDTA by diluting MACS® BSA Stock Solution (# 130‑091‑376) 1:20 with autoMACS® Rinsing Solution (# 130‑091‑222). Keep buffer cold (2−8 °C). Degas buffer before use, as air bubbles could block the column. Complete medium: Prepare a medium from RPMI 1640 containing 2 mM L-glutamine and 1 % autologous plasma. Pre-Separation Filters, 30 μm (# 130-041-407) to remove cell clumps. MACS Columns and MACS Separators: CD14+ cells can be enriched using MS, LS, or XS Columns, or positive selection can also be performed using the autoMACS Pro or the autoMACS Separator. (Optional) Fluorochrome-conjugated CD14 antibodies for flow cytometry analysis, e.g., CD14-FITC (# 130-080-701). Learn more about our antibodies and dyes. ▲ Note: Learn more about different quality grades and additional package sizes of our cytokines and growth factors. ▲ Note: Learn more about different package sizes and conjugates of our antibodies and dyes. MLR medium: Prepare a medium from RPMI 1640 containing 2 mM L-glutamine, non-essential amino acids, 0.1 mM sodium pyruvate, 5 % human AB serum. Isolate CD14+ monocytes from peripheral blood mononuclear cells (PBMCs) using the CD14 MicroBeads, human or CD14 MicroBeads, human – lyophilized. Follow the protocol of the MicroBeads data sheet. Determine purity and recovery by labeling cells with CD14-FITC antibodies and analyzing them by flow cytometry on a MACSQuant® Analyzer 10. Assess cell viability through propidium iodide (PI) staining. Isolation of CD14+ monocytes to high purities. 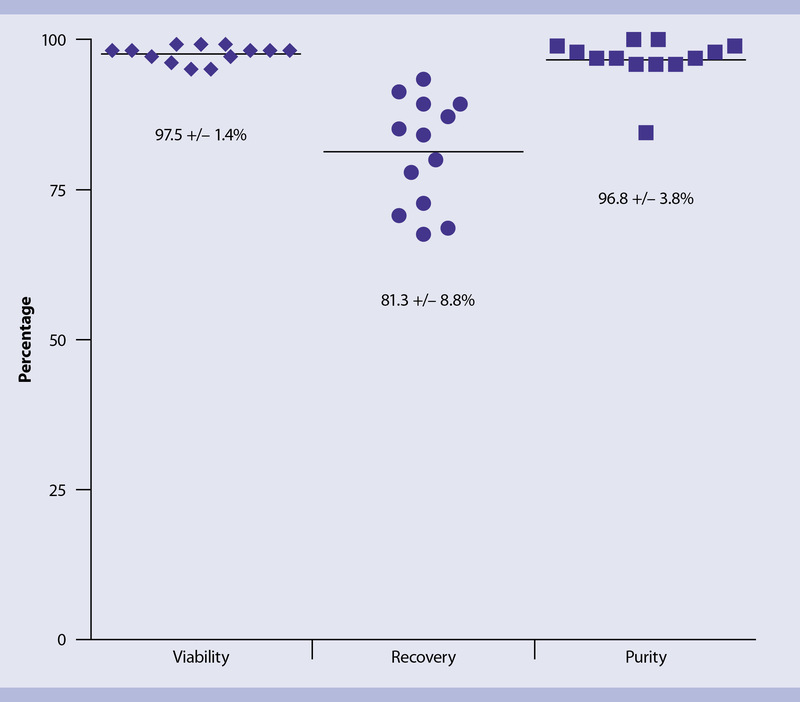 Purity, recovery (i.e., percentage of CD14+ cells in the purified fraction in relation to the original fraction), and viability of enriched CD14+ cells are shown. All values were over 80%. Cells were labeled with a CD14-FITC antibody and analyzed by flow cytometry. Purity, recovery (i.e., percentage of CD14-positive cells in the purified fraction in relation to the original fraction), and viability of enriched CD14-positive cells are shown. All values were over 80%. Cells were labled with a CD14-FITC antibody and analyzed by flow cytometry. Mo-DCs can be generated using various protocol formats, manually and automatically, and at various scales. Here we describe the procedure for 6-well plates as an example. Culture 3×10⁶ isolated monocytes in 3 mL of complete medium (RPMI 1640, 2 mM L-glutamine, 1% autologous plasma) supplemented7,8 with 250 IU/mL IL-4 and 800 IU/mL GM-CSF. Incubate the cultures at 37 °C and 5% CO₂ for 2 days. Resuspend cells in 1.5 mL of complete medium supplemented with the 2-fold concentration of IL-4 and GM-CSF and put back into the original culture. Again, remove a volume of 1.5 mL from the culture and centrifuge. Place the supplemented resuspension back into the original culture and culture for another 24 hours. Assess the viability, yield, and absolute cell count of mature Mo-DCs (mMo-DCs) by flow cytometry via light scatter signals and PI fluorescence. For the gating strategy, see the figure below. Generation of Mo-DCs. Viability, yield (i.e., mMo-DC count in relation to initial monocyte count), and total count of mMo-DCs generated using the protocol for 6-well plates (n= 18). 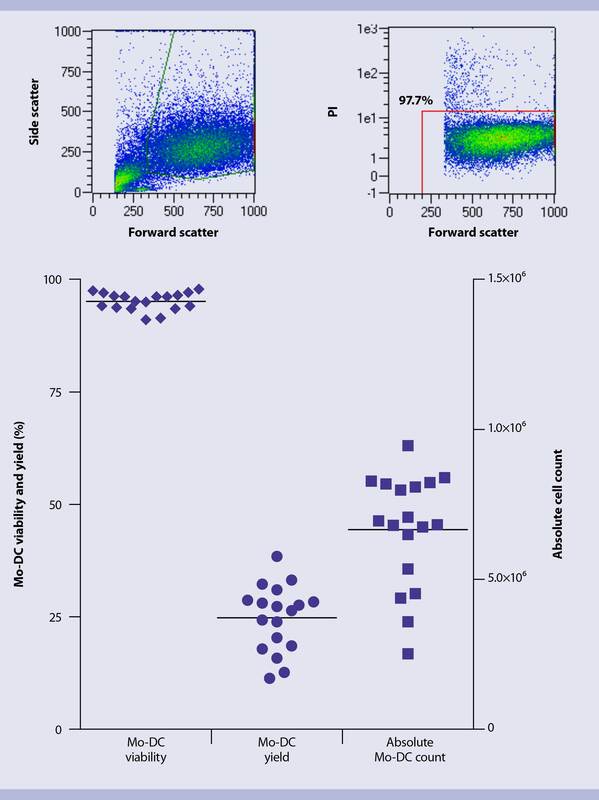 Data were obtained by flow cytometry on the MACSQuant® Analyzer 10 following the gating strategy shown: first cells were gated according to their scatter properties. Subsequently, dead cells were excluded from the analysis by PI fluorescence. The viability of mMo-DCs, evaluated by excluding PI+ dead cells, amounted to 95.4±2.4%. The recovery of mMo-DCs was 23%, calculated based on the number of originally seeded monocytes. Viability, yield (i.e., mMo-DC count in relation to initial monocyte count), and total count of mMo-DCs generated by using the protocol for 6-well plates (n = 18). Data were obtained by flow cytometry on the MACSQuant Analyzer 10 following the gating strategy shown: First cells were gated according to their scatter properties. Subsequently, dead cells were excluded from the analysis by PI fluorescence. Dendritic cells have a distinct morphology characterized by many cellular processes. 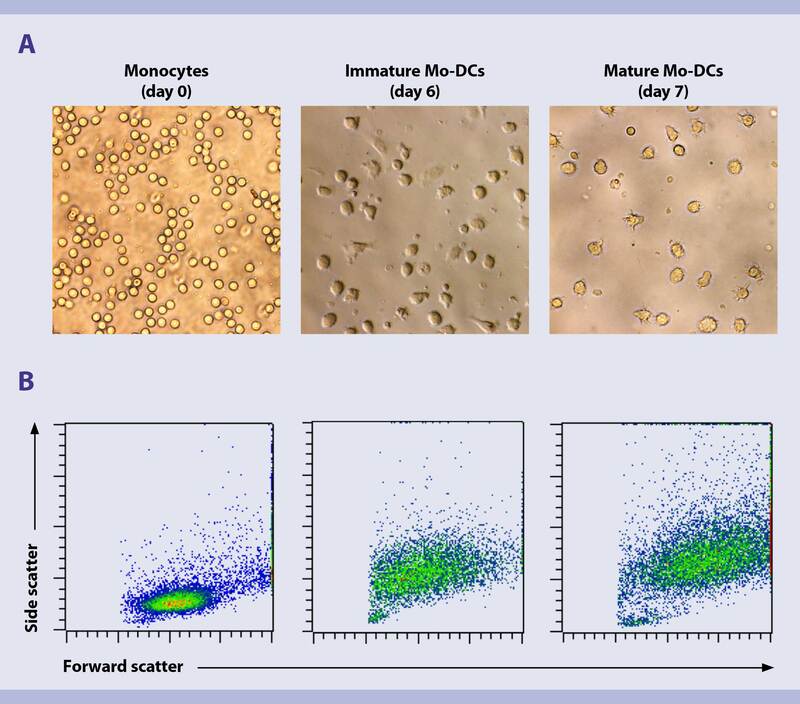 To evaluate whether monocytes assume this morphology during differentiation and maturation to Mo-DCs, we recommend analyzing cells on days 0, 6, and 7 of cell culture, both by microscopy and flow cytometry. Place isolated monocytes, as well as immature Mo-DCs (imMo-DCs) and mMo-DCs, in a 6-well plate and allow to sediment. Capture images of the cells using a light microscope with phase-contrast at a 400× magnification. On day 0, cells had a spherical shape, which is normal for monocytes. After 6 days, cells showed cytoplasmic protrusions, which were even more pronounced after maturation to day 7. Moreover, size and granularity of the cells increased during differentiation and maturation, which is reflected in increased forward and side scatter signals in the flow cytometry analysis. Morphology of monocytes, imMo-DCs, and mMo-DCs. Cells were analyzed on days 0, 6, and 7 of differentiation/maturation. (A) Images were captured on a light microscope using phase contrast at 400× magnification. Cells show increased cytoplasmic protrusions as they differentiate and mature. (B) Assessment of relative cell size and granularity by flow cytometry using forward and side scatter channels, respectively. Cells show increased granularity as they differentiate and mature. 10,000 events are shown for each dot plot. Cells were analyzed on days 0, 6, and 7 of differentiation/maturation. (A) Images were captured on a light microscrope using phase contrast at a 400x magnification. (B) Assessment of relative cell size and granularity by flow cytometry using forward and side scatter channels, respectively. 10,000 events are shown for each dot plot. To analyze cell surface expression of various maturation markers, co-stimulatory molecules, and receptors for chemokines and antigens, label monocytes, imMo-DCs, and mMo-DCs with specific monoclonal antibodies (see table below). Use appropriate isotype controls to assess non-specific antibody binding. Determine the mean fluorescence intensity (MFI) of the respective markers by flow cytometry on a MACSQuant® Analyzer 10 using the MACSQuantify™ Software. Exclude cell debris and dead cells from the analysis based on scatter signals and PI fluorescence. the antigen-presenting molecules MHC I (HLA-ABC) and MHC II (HLA-DR). Mature Mo-DCs also expressed the DC activation markers CD83, CD25, and CD40, which were up-regulated accordingly. CCR7, which is required for migration of DCs to draining lymph nodes, was also up-regulated. The highest expression levels of the antigen uptake receptors CD209 and CD206 were detected on imMo-DCs, corresponding to their antigen uptake function. Immunophenotyping of monocytes, imMo-DCs, and mMo-DCs. Cells were labeled on days 0, 6, and 7 with antibodies specific for the respective markers and analyzed by flow cytometry. The histograms show the results from one representative experiment. Marker-specific and isotype control labeling are shown in red and black, respectively. The plots below the histograms depict the MFI for each marker on monocytes, imMO-DCs, and mMo-DCs in six independent experiments. Cells were labeled on days 0, 6, and 7 with antibodies specific for the respective markers and analyzed by flow cytometry. The histograms show the result from one representative experiment. Marker-specific and isotype control labeling are shown in red and black, respectively. 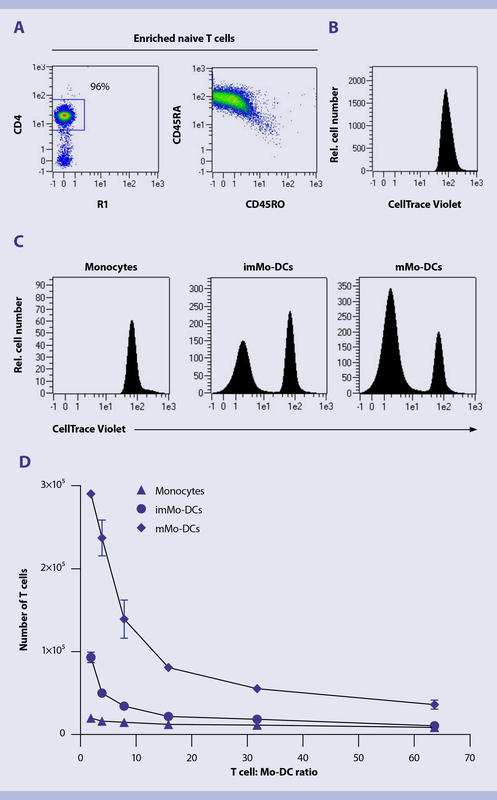 The plots below the histograms depict the MFI for each marker on monocytes, imMo-DCs, and mMo-DCs in six independent experiments. Antigen uptake by antigen-presenting cells can occur specifically via receptor-mediated endocytosis or non-specifically via pinocytosis or phagocytosis. To assess the pinocytosis capacity of in vitro generated Mo-DCs in comparison to monocytes, cells are cultured at 37 °C for up to 1 h in the presence of FITC-dextran. Non-specific binding of FITC-dextran to the cell surface is determined by incubating samples on ice throughout the procedure. The MFI of FITC is then analyzed by flow cytometry after various time points, subtracting the MFI of samples on ice from the MFI of samples incubated at 37 °C. Incubate 1×10⁵ monocytes, imMo-DCs, or mMo-DCs with FITC-labeled dextran (1 mg/mL) in complete medium (RPMI, 2 mM L-glutamine, 1% autologous plasma) for 5, 10, 20, 30, and 60 minutes at 37 °C. Keep a control sample on ice for 60 min to check for non-specific binding of FITC-dextran to the cell surface. After 60 min, wash all samples twice. To do so, centrifuge samples for 5 min at 300×g and 4 °C and resuspend cells with ice-cold PBS supplemented with 1% fetal calf serum (FCS). Repeat the centrifugation step above and resuspended cells in PBS supplemented with 0.5% BSA. Keep samples on ice until flow cytometry analysis. Determine the uptake of FITC-dextran by measuring the mean fluorescence intensity (MFI) of FITC. Exclude dead cells from the analysis by PI fluorescence. Specific uptake of FITC-dextran is calculated by subtracting the MFI of the control sample that was incubated on ice from the MFI of the samples incubated at 37 °C. Immature Mo-DCs had the highest antigen uptake capacity, reflected in a continuous increase in MFI over the entire time course. Antigen uptake was decreased when Mo-DCs were matured for an additional 2 days (day 9). Monocytes showed negligible antigen uptake capacity compared to Mo-DCs. Additionally, flow cytometry analysis showed that imMo-DCs exhibited the highest expression of the antigen uptake receptors CD206 and CD209. These results correlate with the finding that imMo-DCs lose their antigen uptake function upon maturation. Antigen uptake capacity of monocytes and Mo-DCs. (A) Flow cytometry results from a representative experiment with imMo-DCs cultured at 37 °C in the presence (red) or absence (black) of FITC-dextran for the indicated amounts of time. Non-specific binding was determined by incubating cells on ice. (B) Relative FITC-dextran uptake was calculated by subtracting the MFI of cells incubated for 60 minutes on ice (MFIIce) from the MFI of cells incubated at 37 °C (MFI₃₇). Results are shown for monocytes, imMo-DCs, and mMo-DCs (days 7 and 9). (C) Monocytes and Mo-DCs were labeled with CD206-APC or CD209-APC antibodies and analyzed by flow cytometry. (A) Flow cytometry results from a representative experiment with imMo-DCs cultured at 37 °C in the presence (red) or absence (black) of FITC-dextran for the indicated amounts of time. Non-specific binding was determined by incubating cells on ice. (B) Relative FITC-dextran uptake was calculated by subtracting the MFI of cells incubated for 60 minutes on ice from the MFI of cells incubated at 37 °C. Results are shown for monocytes, imMo-DCs, and mMO-DCs (days 7 and 9). 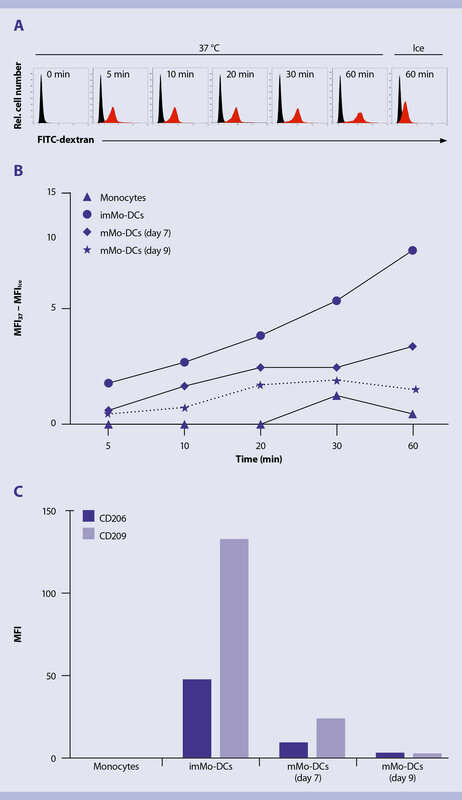 (C) Monocytes and Mo-DCs were labeled with CD206-APC or CD209-APC antibodies and analyzed by flow cytometry. Upon activation of DCs in the periphery, the cells migrate to the draining lymph nodes where they encounter naive T cells. Migration depends on the expression of CCR7 on the DC surface11. The CCR7 ligand CCL19 acts as a chemoattractant for DCs and is expressed in the lymph node areas characterized by high T cell densities. Resuspend mMo-DCs in RPMI 1640 with 10% FCS at a density of 5×10⁵ cells/mL. Place 200 µL of the suspension in the upper compartment of a 24-well Transwell® Plate. 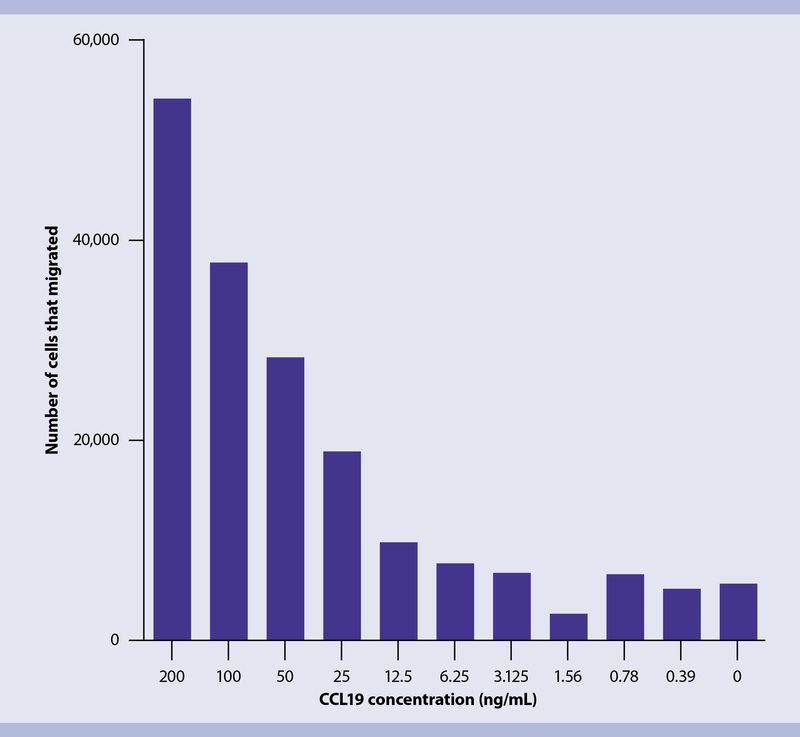 Fill the lower compartment of the Transwell Plate with 600 µL of complete medium supplemented with Human CCL19 (MIP-3β) at different concentrations. After 3 h, harvest the cells contained in the lower compartment of the Transwell Plate and count them by flow cytometry. CCR7 expression was up-regulated during Mo-DC maturation. mMo-DCs migrated towards the CCL19 stimulus in a dose-dependent manner. Migration of mMo-DCs towards a CCL19 stimulus. The mMo-DCs (1×10⁵ cells) were placed in the upper compartment of a 24-well Transwell Plate. Medium containing different concentrations of CCL19 was placed in the lower compartment. After 3 h, the total number of cells that migrated to the lower compartment was determined by flow cytometry. The mMo-DCs were placed in the upper compartment of a 24-well Transwell Plate. Media containing different concentrations of CCL19 was placed in the lower compartment. After 3 h, the total number of cells that migrated to the lower compartment was determined by flow cytometry. Technology, and their plasma membranes are labeled with CellTrace™ Violet. After coculturing with monocytes or Mo-DCs for 7 d, the number of T cells and the CellTrace Violet staining is analyzed by flow cytometry. As with each division of the T cells the dye gets more diluted in the plasma membrane, an increase in unlabeled cells indicates a high T cell proliferation rate. Isolate naive allogeneic CD4+ T cells from PBMCs using the Naive CD4+ T Cell Isolation Kit II, human. Follow the protocol of the kit data sheet. Determine purity of the isolated cells. Label cells with CD4-PE or CD45RO-APC and CD45 RA-PE antibodies and analyze by flow cytometry. Suspend 5×10⁶ purified naive CD4+ T cells in 400 μL PBS. Label cells with 100 μL of a 10 μM CellTrace Violet solution for 5 min at room temperature. Wash cells once with 1 mL FCS and three times with 2 mL MLR medium (RPMI 1640, 2 mM L-glutamine, nonessential amino acids, 0.1 mM sodium pyruvate, 5% human AB serum). Resuspend the CD4+ T cells in MLR medium at a density of 5×105 cells/mL. serially diluted according to the table below. Place 100 µL of each cell dilution in a well of a 96-well plate. Add 100 µL of the labeled T cells into each well and culture for 7 days at 37 °C, 5% CO₂. Determine proliferation of CD4+ T cells by measuring the fluorescence of CellTrace Violet by flow cytometry. Exclude cell debris and dead cells from the analysis by scatter signals and PI fluorescence. Serial dilution of Mo-DCs/monocytes for MLR assay. negative T cells in the culture. This correlated with higher T cell numbers, as determined by cell counting. the result from the immunophenotyping showing that receptors involved in T cell priming are up-regulated on Mo-DCs upon maturation. were cocultured with monocytes, imMo-DCs, and mMo-DCs at a ratio of 16:1 for 7 d and analyzed by flow cytometry. (D) Naive T cells were cocultured with imMo-DCs and mMo-DCs at various ratios. After 7 d, the numbers of T cells were determined by flow cytometry based on scatter signals. Dead cells were excluded from the analysis by PI fluorescence. One of three representative experiments is shown. (A) Naive CD4+ T cells were isolated from PBMCs with MACS Technology. Isolated cells were stained with CD4-PE or CD45RA-PE/CD45RO-APC antibodies and analyzed by flow cytometry using the MACSQuant Analyzer 10. (B) Isolated naive T cells were labeled with CellTrace Violet and analyzed by flow cytometry. (C) CellTrace Violet-labeled naive T cells were cocultured with monocytes, imMo-DCs, and mMo-DCs at a ratio of 16:1 for 7 d and analyzed by flow cytometry. (D) Naive T cells were cocultured with imMo-DCs and mMo-DCs at various ratios. After 7 d, the numbers of T cells were determined by flow cytometry based on scatter signals. Dead cells were excluded from the analysis by PI fluorescence. One of three representative experiments is shown. of TH1-polarizing IL-12, but also the secretion of the immunosuppressive IL-1012-14. However, for studies towards the development of cancer therapies it is desirable to generate Mo-DC populations secreting high amounts of IL-12 and low amounts of IL-10 as these cells generate a more effective antitumor response via induction of TH1 cells. Mo-DCs can be stimulated under various conditions to determine their capacity to secrete IL-12 and IL-10. They can be incubated with soluble Human CD40-Ligand, which form multimers in vitro, or they can be cocultured with a J558L cell line expressing CD40L. Seed wells of a 96-well plate with 5×10⁵ cells. Add 16 µg/mL Human CD40-Ligand to each well to stimulate the mMo-DCs. For comparison, coculture mMo-DCs with CD40L-expressing J558L cells at different densities (7×10⁴, 14×10⁴, or 28×10⁴ cells/well). Stimulate Mo-DCs for 24 h at 37 °C, 5% CO₂. Collect cell supernatants and centrifuge for 10 min at 300×g to remove any cells. Determine the concentrations of IL-12p70 and IL-10 by specific ELISAs (eBioscience). Stimulation with soluble CD40L led to production of high levels of IL-12 and low levels of IL-10. Coculture with CD40L-expressing J588L cells resulted in an overall increase in secretion of both IL-12 and IL-10. However, the ratio of IL12/IL-10 was higher after stimulation with soluble CD40L than after coculture with the cell line. 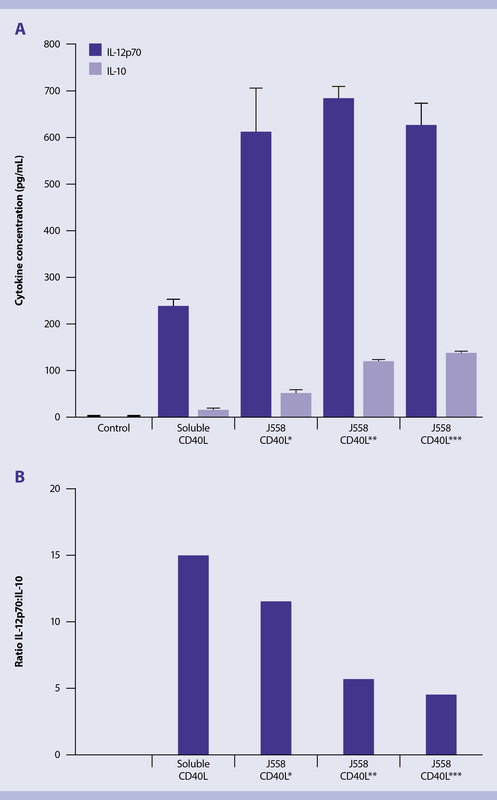 Thus, recombinant human CD40L multimers represent an attractive alternative to CD40L-transfected cell lines, allowing for CD40 stimulation of Mo-DCs under defined conditions. IL-12 and IL-10 secretion by mMo-DCs upon stimulation with CD40L. (A) The mMo-DCs were cultured for 24 h in the absence or presence of soluble CD40L (16 μg/mL) or a J558 cell line expressing CD40L (*7×10⁴ cells/well, **14×10⁴ cells/well, ***28×10⁴ cells/well). IL-12p70 and IL-10 concentrations in the culture supernatant were determined by ELISA. (B) The ratios of IL-12p70 vs. IL-10 were calculated based on the results shown in (A). (A) The mMo-DCs were cultured for 24 h in the absence or presence of soluble CD40L (16 µg/mL) or a J558 cell line expressing CD40L. IL-12p70 and IL-10 concentrations in the culture supernatant were determined by ELISA. (B) The ratios of IL-12p70 vs. IL-10 were calculated based on the results shown in (A). 1. Palucka, K. and Banchereau, J. (2012) Nat. Rev. Cancer 12: 265–277. 2. Banchereau, J. and Steinman, R.M. (1998) Nature 392: 245–252. 3. Acuto, O. and Michel, F. (2003) Nat. Rev. Immunol. 3: 939–951. 4. van Kooten, C. and Banchereau, J. (2000) J. Leukoc. Biol. 67: 2–17. 5. Figdor, C.G. et al. (2004) Nat. Med. 10: 475–480. 6. Hubo, M. et al. (2013) Front. Immunol. 4: 51–63. 7. Romani, N. et al. (1994) J. Exp. Med. 180: 83–93. 8. Caux, C. et al. (1994) J. Exp. Med. 180: 1263–1272. 9. Jonuleit, H. et al. (1997) Eur. J. Immunol. 27: 3135–3142. 10. Feuerstein, B. et al. (2000) J. Immunol. Methods. 245: 15–29. 11. Martín-Fontecha, A. et al. (2003) J. Exp. Med. 198: 615–621. 12. Moser, M. and Murphy, K.M. (2000). Nat. Immunol. 1: 199–205. 13. Trinchieri, G. (1994) Blood. 84: 4008–4027. 14. Iwasaki, A. and Kelsall, B.L. (1999) J. Exp. Med. 190: 229–239.